Can I upgrade to Windows 10? 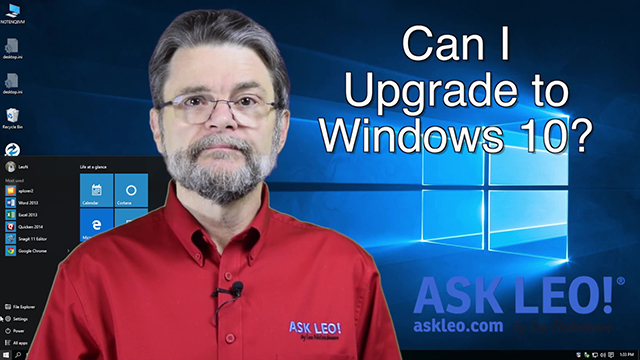 Continue Reading: Can I upgrade to Windows 10? Why is Windows 10 being downloaded to my machine? And how do I stop it? Microsoft made a liar out of me. I'd confidently asserted that unless you asked for Windows 10 – either by direct download or by accepting the "reservation" they offered before launch – Windows 10 would not be downloaded to your machine. I figured people who claimed otherwise had obviously forgotten that they'd somehow asked for it. That reservation thing was pretty confusing, after all. As reported by The Inquirer, and several other news outlets, Windows 10 may be downloaded to your machine whether you want it or not. Continue Reading: Why is Windows 10 being downloaded to my machine? And how do I stop it? How do I view hidden files and folders? I have my old Outlook .pst file on a flash drive, but I cannot get it to my hard drive. The location of the newly created Outlook .pst file is in the location – c:\Users\Username\AppData\Local\Microsoft\Outlook – but when I try to step into that location, there is no "AppData" folder. What am I missing? Windows is trying to be helpful by protecting you from yourself. Or perhaps it's trying not to confuse you with too much data. Or maybe it's trying to protect itself from you. Whatever … Windows is hiding that folder. You and I, we know what we're doing, so we'll tell it to stop. Continue Reading: How do I view hidden files and folders? What does "Chkdsk cannot run because the volume is in use by another process" mean? File system (also "filesystem", one word) is the term used to refer to the specific technique that allows files to be laid out and located on a hard disk or other random access storage device. At its most basic, a file system is nothing more than the specific format of the overhead information used to keep track of what data is stored where on a hard disk and the rules used to place and locate that data. Since most hard disks and similar devices store data as files, then this is the "system" by which those "files" are placed on the media. In addition to defining exactly what gets stored where, file systems also define what capabilities are present such as encryption, compression, the length of filenames, the maximum size of files and even whether or not file names can include both upper and lower case characters. File systems may also include information relating to security and permissions, allowing the operating system to control who may or may not perform operations on the files themselves. There are dozens, if not hundreds of different file systems, but the two most common in Windows-based computers are the FAT (File Allocation Table) file system and NTFS (New Technology File System). The FAT file system predates Windows but is still commonly used on Windows-compatible memory cards used on mobile and small devices due to its comparative simplicity. NTFS is the more common file system for hard disks due to its generally better performance, capacity and the ability to support important aspects of data security. Well, my only experience so far with Windows 10 comes from two clients who upgraded and had the computer unusable after the update. (And, of course, neither of them had bare-metal backups, or any backup at all for that matter.) So, my extremely small sample size agrees with your "not yet" assessment. On the other hand, a few co-workers upgraded to 10 without any issues. "Back up. If it's only in one place, it's not backed up." is a good argument in favor of the cloud. You may have a good local backup in place, but a fire or a robbery can destroy all that. 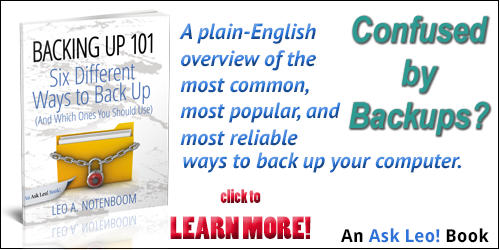 An additional backup on the web can save your backside. I haven't commented here before, but this article prompted me. I have been reading your newsletter for years. I don't usually read all of it, but the parts that interest me. I work on computers and am self taught. I'd like to feel I've helped a fair # of people over the years. A large part of why I am able to do so is BECAUSE of your newsletter. You explain things in a manner "normal" people can understand. I cannot see a day I won't be reading your newsletter and using your information to help others. In other words, thank you, you DO make a difference in my extended world. A number of years ago I learned two important concepts that relate to change. The second concept I learned was taught by Roger L. Kirkham. In teaching a class titled "How to Manage Change", he summarized the need for change by the following few words. "Things that don't change, stay the same or get worst." He expanded the concept by adding that not every change is an improvement, but every improvement requires a change of some type. The business landscape it littered with failed organizations that failed to change. One classic example of failure to change is Kodak. That organization invented digital photography, but failed to make the changes needed to remain viable as their invention was embraced by their customers. Regards and thanks for a great informative site.